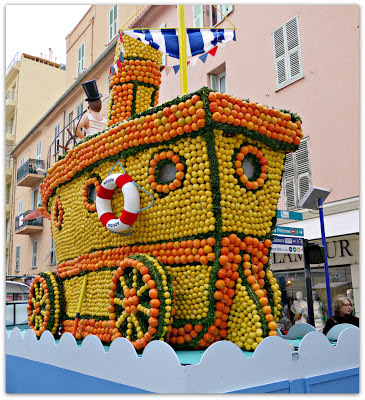 I love lemons and always have, so it's lucky for me that we live just a short drive away from the pretty sea side town of Menton, France where some of the world's best lemons grow. For the past 80 years, Menton has hosted a charming festival called, La Fête du Citron. It's pure heaven for a lemon lover like me. To showcase the humble lemon, a team of workers create enormous, elaborate sculptures made from sturdy iron frames and chicken wire that they then cover with plump lemons and oranges using millions of thick, wide elastics. 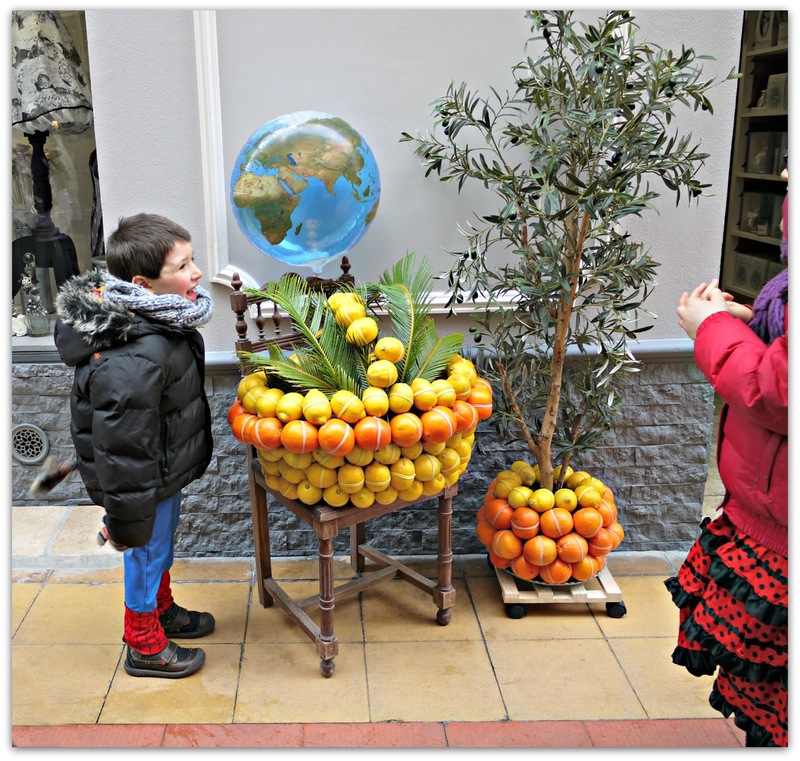 These days, the lemons and oranges come from Spain since they're cheaper and more plentiful than the ones grown in Menton. In all, they use about 120 metric tons to decorate the sculptures on display in the Jardin Biovès and to coat the parade floats that circle the downtown core a few times a week during the three week festival. 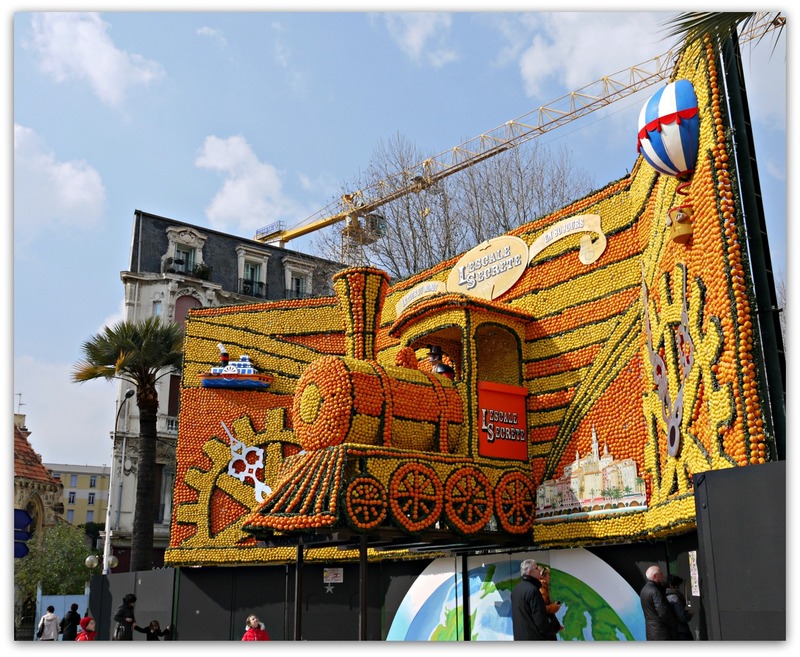 Everyone in Menton gets into the act. The restaurants serve dishes with Mentonaise lemons, bakeries do a booming business in lemon tarts and the local market is filled with baskets of Menton's famous lemons for sale. 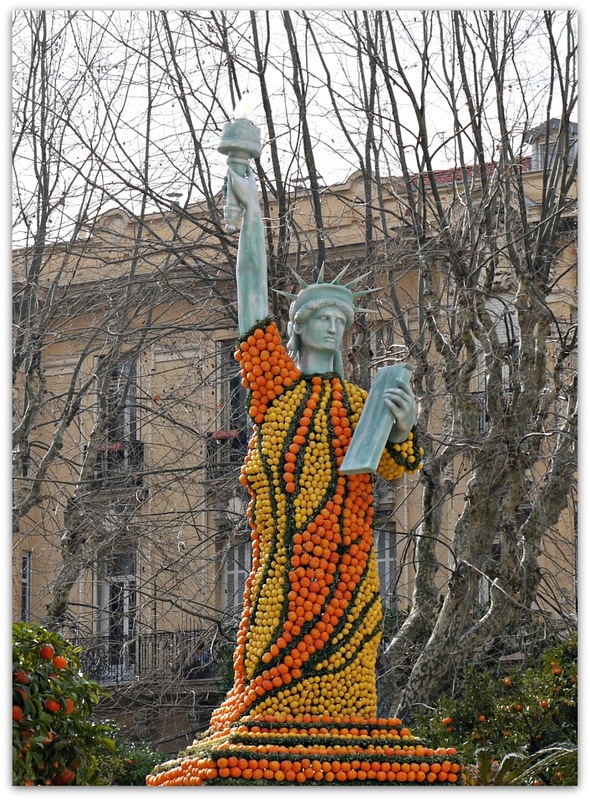 For years I've wondered what the town does with all those lemons and oranges when the festival is over and today I found out. About 90% of them are still considered edible and are up for grabs for a Euro or two per kilo, about half the price of the fresh ones. The day they disassemble the sculptures you just need to show up with a basket, a grocery cart or pickup truck and fill 'er up. The mind boggles! 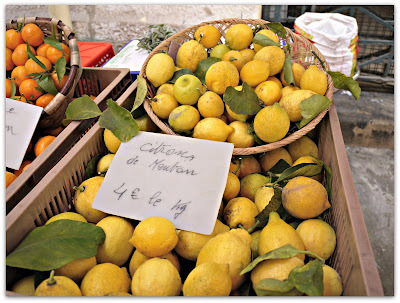 I know what I'd to do with a ton or two: make a giant bowl of my Lemon-Almond pudding for everyone in Menton. I make almond milk all the time and it couldn't be easier. Its bright white colour and clean, rich taste pairs perfectly with lemon. 1. Prepare the almond milk. Suspend a fine sieve* (see Tip #1 below) over a 1 litre bowl. Rinse the soaked almonds until the water runs clear, place them in a blender with the 3 cups (750 ml) water and blend on high for 3-4 minutes. Pour the mixture through the sieve and measure 2 1/2 cups. Set aside. 2. Add the lemon zest to the sugar and rub the two together with your fingers. This will release the oils in the zest and give the pudding a lovely flavour. 3 In a medium saucepan, combine all the ingredients. Suspend a fine sieve over a bowl large enough to hold the pudding and keep it by the stove. Stir the mixture on medium heat until it just starts to boil and continue stirring the pudding for a minute more. Pour the hot pudding through the sieve into the bowl and press it through the sieve. Press some cling film directly on to the surface of the pudding and refrigerate until serving. 1. To make a smooth, silky pudding, you need to remove as many of the fine particles of almond that remain after you process them in the blender. If you don't have a really fine sieve, pour the blended mixture through 3-4 layers of cheesecloth. Alternatively, you can let the almond milk sit for an hour or so to allow the particles to settle to the bottom. You can then ladle the milk off the top, leaving the particles at the bottom. 2. I sometimes garnish these puddings with candied lemon zest that I make by simmering the zest of one lemon in 1 cup of water and 1/4 cup of sugar for about 15 minutes. You could also sprinkle on some crushed commercial Amaretti biscuits, slivered toasted almonds or just enjoy it unadorned. Thank you for sending out a little sunshine in a cup. I swear I can smell the lemons through the computer screen (if only)! One year ago? Seems like we've been time travelling and shoe shopping a lot longer than that. 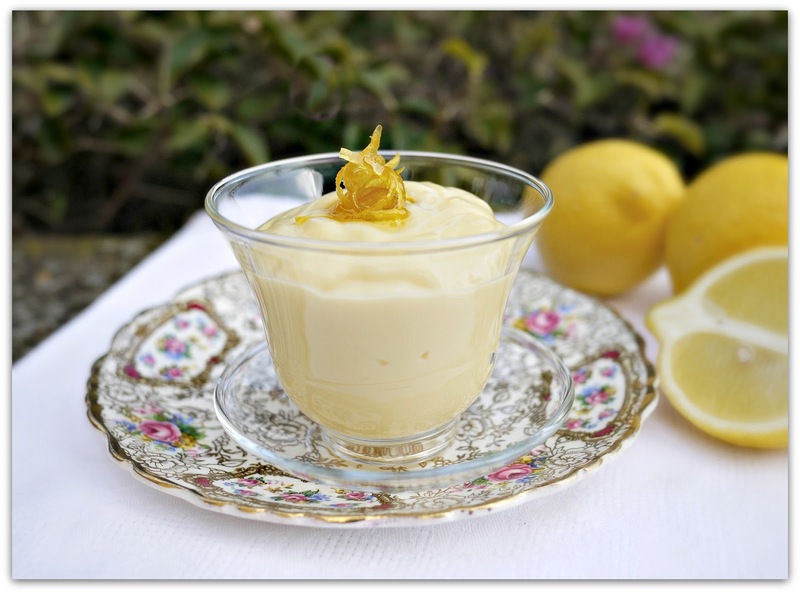 I'd make you lemon pudding any time you'd like. Sounds great. Heather and I will be right over. This recipe sounds so delicious. I am a lemon lover too. Don't forget Ben and Kipling. MmmmmMmmmmmMmmmmmm. . . I just made this. The only thing I did differently was use store bought Almond Milk. Had some farm fresh eggs and just bought a bag of lemons, came home from the store and googled lemon pudding with almond milk. WOW! My husband isn't home yet, so I got to clean out the bowl. Thank You! Delicious and simple!